I’ve become curmudgeonly in my “older” age. To my dismay, I’ve found myself drifting away from my more idyllic attitudes of 12 years ago, and settling into deeper, more moody, thought patterns that have me thinking more like Gary Stager than I would like to admit (although I certainly wouldn’t approach his level of bombastic rhetoric). I’m being slightly alarmist here; I’m only 34, and I certainly have a long ways to go to cement myself in the straight jacket of “old man grumpiness”. Perhaps it’s the role I find myself increasingly playing at school; the “anchor” attempting to slow down and “manage” some of the institutional changes in my district while simultaneously allowing the “explorers” to push ahead. The cognitive dissonance of working both angles is stressful at times. Which is why I’m tossing this challenge out here, provided anyone actually reads it. I want to believe that most technology has amazing educational applications. I want to know that some of the up and coming leaders in the educational technology world are up on stage (or their Youtube channels) singing the praises of amazing educational opportunities, not just the same old “snake oil” sales pitch that even I’ve pitched in the past. Your Challenge – Show me the promise of Augmented Reality beyond the current “fluffiness” that has captured the internet’s heart. 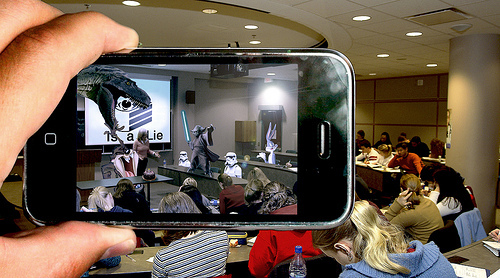 AR, Augmented Reality, is the newest darling to hit the mobile scene for education. I’ve seen “hot new” devices and technology come and go (interactive whiteboards, webquests, PDAs, netbooks, etc.). For the most part, our tools are what we make of them, but they can only be stretched so far. Is the promise of Augmented Reality being stretched too far? When Andy Losik, king of the “let’s do awesome stuff for education” crowd here in Michigan, starts questioning the value of how a technology is applied to the learning environment, I take notice. “New hotness” is great for highlight reels, but we need a lot of depth on our educational benches, and I’m not seeing that yet from Augmented Reality. I’m always suspicious when products and/or technologies are rapidly adopted for advertising and marketing campaigns. Yes, there’s something to be said about the power of a tool that seems so magical it puts a smile on the face of all that see it (myself included). I’m just looking for applications beyond the “engaging hook” factor. I’m sure they’re out there, I just need someone to show me the deep student-led application of AR in the classroom. There’s a serious “creepy factor” to Google Glass and other augmented reality devices that seem to break certain pre-conceived notions of privacy and causes discomfort when you’re unsure of what’s being captured or not. To be clear, I’m not saying that Augmented Reality is a poor learning tool; just questioning whether it’s time in our classrooms as a powerful learning device is here, or if it’s still in incubator stage. Interactive whiteboards were promised to be “transformative” teaching and learning tools when they exploded in the early 2000s. While I still believe they can be effective and creative tools in the hands of the right individuals, the reviews on their impact appear to be mixed. As we stand at the precipice of mobile device ubiquity in our classrooms here in the United States (well, those school districts with any money left), I fear that Augmented Reality and other “apps” may prove to be just as tempting, yet underwhelming in delivery. Are my thoughts off base? Am I wrong? Does someone have some great examples of the promise of Augmented Reality fulfilled in ways that aren’t just 3D encyclopedias, or playful “auras” that are being gobbled up as the latest marketing sensation? Am I even asking the right questions? I hear what you are saying, loud and clear. My company takes the stance that education before gimmicks is the key to the technology. Our AR app is versatile in the fact we create campaigns for museums that allow students to engage with exhibits. We also create “Back in time” experiences where the younger generation can walk downtown and view building as they were 100+ years ago in real time. Last, but certainly not least, we create interactive print ads for businesses and for education. The future of Augmented Reality has a bright future, it just has to learn how to walk first before it leaps. Thanks for the comments, Wil. I’m down with the virtual museum exhibits, and helping create a “hook” for patrons and learners at an institution; I’ve designed some simple museum kiosk interactives with students in the past, so I know it’s draw. To your point about the marketing and AR advertisements, that’s one of the things that I see so prevalent with augmented reality that makes me nervous; lots of teachers going out to buy special cards, coloring papers, etc. to make the apps work properly. More proprietary stuff to make our gadgets works well. Come on now Ben! You are “Mr. Outside the Box” You can get into this! I was introduced to it in Dec. 2012 at the VSTE Conference by Steve Dembo, @teach42. It’s taken me the past year to perfect, understand, and master the art of using the Aurasma App, but I am loving it! Please Ben, you are one of my top guys I follow when it comes to “Tech Integration Inspiration.” You have got to jump in the deep end and start swimming! I knew you’d have some links for me Ty! Aurasma intrigues me, as I see a lot of potential creating community history walks, virtual museum docents, and other applications that allow learners to “displace” their presentations to other places and times. There’s still something that bugs me, much the same way that QR codes have in the past. Written text, video, audio all works natively in both the analog space, and on all of our digital devices. Maybe it’s the fact that augmented reality still lays behind layers of tech and applications that aren’t ubiquitous and don’t play nicely with one another; I can’t view Aurasma auras with anything but the Aurasma app. Ok – so I know where you’re coming from. AR is kinda entertaining and max hype. Thing is, it’s much, much more and is basically the last frontier of smart devices exceeding our own sense perception of the world. AR iOS the first and last browser of the way we will experience digital in the future. In the future. There will be no other digital devices outside of EEG-capable, HUD eyewear. Why use any other form of digital or rich media consumption hardware when your eyewear can augment it anywhere you want it to be? So there will be no computers, just lens interfaces. How far are we away from that? Less than 3 years . Connected to EEGs? Absolutely: what is augmented will change, based on content, context and emotion . All this software is nearing completion – the hardware is not far behind. For education, the attention levels and engagement of students willbe augmented in your eyewear’s POV, in real time, courtesy of the students’ EEG-integrated AR eyewear. Augmented Reality is absolutely the next internet. What you wrote above, I see in light of circa 1993. Translated as: why build a web page! If people want to buy from you, or meet you, they can drive to your retail premises and see you. Why would they buy from a place where they can’t try stuff on? Pedagogically, and psychologically, AR anchors content in kinetic sense-memory learning. AR is both the greatest threat and best thing that the education sector has ever seen, no doubt. Ultimately, it’s change. A lot of change. I LOVE the “Kurzweilian” attitude you have about the future of wearable technology, Dave. It’s quite positive, and paints a nice picture of augmented reality being an almost “native” sense with tech that is almost invisible (see my earlier comment to Tyler). I just don’t happen to be sold on that future yet. Sure, it could very well be the whole “I don’t see the value in this internet thing” argument, but with the internet it was text and images, both mediums that are readily recognizable and familiar with people; the “a-ha!” moments came quickly. With augmented reality I get the “this is cool, I can see the future”, but it’s a LONG way off, and filled with lots of promises. I’ve been working with technology in education now for 10 years, and the one thing we have an over abundance of is promises and shiny toys that we collectively seem to lose interest in every few years or so. I like where you’re going with your last comment. Change is change…I’d just like to see a lot more change happen with AR to get me excited about it. I hear where you’re coming from, Ben. I think part of the response is that the hardware and software are not accessible enough yet. Meaning they’re not cheap enough, easy enough to use, and available in enough forms. There are some exceptions, but this technology is still in its early stages. I’m confident that eventually it will become a useful tool for educators on a large scale. I’m glad to see it’s on the downswing of the hype cycle, because I’m not sure how many more AR conference sessions I could sit through watching presenters promise to “blow my mind” with a virtual diagram popping up on my iPhone screen. Certainly looking forward to the day that AR becomes a more seasoned technology. But if you are interested in trying to help more progressive sorts of learning take place then AR has much more limited appeal. If critical thinking and autodidacticism are your goals then the tools that will really make a difference are the ones that allow students to more easily engage in thoughtful conversation and create and share with an audience that can give them feedback. I think AR has some potential to allow kids to do that in new ways, but I don’t think that it is in any way a game changer. There are already tried and true tools (wiki’s, blogs, forums, video sharing, real-time text, audio, and video chat) out there that will help with these progressive goals and I don’t see AR as being a revolutionary improvement on them. That’s rather insightful of you Ryan, and probably hits closet to the mark of any of the responses thus far. I tend to view the world from an egocentric point of view (as most of us). I would firmly put myself in the more reflective, critical thinking world of the autodidact, and thus tend to want others to be in that space as well since there always seems to be a much richer world of learning going on there. As someone who spent 7 years in the classroom, I often had to use something “flashy” to get student’s attention as well; I understand the need for the newest, latest, best in regards to hooking a mass audience. As you said though, I’m not sure if AR has the legs to make it past that stage into an area of learning in which the students are really going to be forming some deeper understandings. I would LOVE to see a tool that mashes up AR with Trimble Sketch-Up, in that users could create 3D objects with their device directly in the projected and augmented world they’re viewing; turning the world into a virtual canvas, rather than just a virtual bulletin board like Aurasma and some of the other mainstream AR apps do. When Ben Rimes asks questions, it’s best you pay attention to the answers. I think for me, AR is definitely another flashy thing to use in teaching. I’ve seen some cool applications like Layar, which allow anyone to create some AR for print materials. For me, that meant adding a special icon on posters, worksheets, and labs that would play an extension video for students when they looked at it. It was easy, on the fly extension if they were interested in that. Cool, but not game changing. Part of the disconnect when you look at transformative practice is that AR doesn’t connect you with anyone. Blogs, wikis, and social media can change the way we approach teaching and learning at a fundamental level because of the human connections we make. Writing for your audience or connecting with someone in a different culture make us rethink who we are as teachers and learners. AR adds a flashy layer for engagement, and not a whole lot more. Sure, it can get kids interested, but so can a lot of other reality around us. Maybe we should all look at LARPing in schools…take it to the max. I’m totally down with the addition of some rich media that might otherwise be difficult to add to a static “analog” learning object, and that’s how I see it being applied mostly in classrooms; my concern is that it’s getting an overinflated spotlight at the moment because of how relatively new it still is in the consumer mobile space. I don’t see why it is supposed to connect with the outside world to make it worthwhile. Yes, AR is still very new in its inception into the classroom, so finding a lot of great examples will be hard to come by. I really think BECAUSE it is so new and hard to find its value in the classroom other than flashiness, it is that much more important that we, as outside the box techie teachers, find the ways to actually make it worthwhile and not just flashy. Now this isn’t to say that it is an easy task by any means, but just throwing it aside as a “flashy” tool and not a great classroom tool is really selling it short. I think what Brian is saying is that currently Augmented Reality is a one-way street; a means for me to publish and others to consumer what I’ve put out there. Yes, I can narrate a learning experience, yes I can teach someone a new concept or reinforce recent learning thanks to video, but it’s not a collaborative tool, at least not how it’s currently being used. That’s not an indictment, just a pondering that perhaps applications of technology like AR are perhaps stealing a bit too much of the limelight given many educators still haven’t experienced the power of a Skype connection with another class, or a collaborative writing project between students who may never meet face to face. Perhaps we’re selling it too short and dismissing the flashiness of it, but as Ryan stated in his comments above, it could just be where we’re at in our educational lives/experiences as well; seeking some deeper tools and applications for reflective practices and methods. The need for some something engaging and playful will always be there, I might just not be as focused on it as much at the moment. Great thoughts everyone, really enjoying this thread! To me the problem of AR is that you have to use a device to see it, which would work great in some case such as being able to view what a city looked like in the past, watching a video, or looking at the stars, but the current form of AR is more of a stepping stone to a hologram projection that the device outputs like in the Iron Man movies. Once it gets to that point, where a user can interact with a projected image, AR will be an amazing tool for education. Thinking about that, as mentioned above, the problem is that for the most part it is a one way street with information. The user does not interact with it much differently than a normal assignment. Yes, you may get a 3D image of a muscular skeleton system but that is only marginally better than a flat picture if you cannot interact with it. Thinking on how it could be more useful: like the Aurasma was used for Flat Stanley, AR could be a great way to keep a record of student digital work. Or, and I really like this idea, is have an App that can put hats/masks/moustaches/etc on people and let the kids do a play. Of course, many webcam apps have already had this ability for a long time, but I do not think I have seen one that accommodates a large group and does a good job tracking movement. It would be amazing to have something like Toontastic (iPad animation app) except it be on top of reality. I bet that would be difficult to code.